So much of my anxiety for this last minute trip was about my ability to fly long haul with all my conditions. I figured I could be in pain at home so why not be in a magical new place to experience. 1. Write a list and use it to prepare for your journey the week leading up to when you go. I work from my head down and make sure I have all I need written down. Then make sure it is clean, mended and still fits before packing to the lets take it pile. 3. Book special assistance when you book your plane tickets – if your health is like mine it is unpredictable and the help around the world makes travel much more pleasant. Take your worst case scenario aids – for me that includes extra pain meds, mohair gloves, antiflamme, arnica crutches and wrist braces. Better to have all that you may need than wish you had it all if you end up unwell. 5. Invest in a watch that has dual time. Set your main time for the time of your destination on the morning you travel so you start adjusting before you hit the air. Set the less obvious time set to home time to ensure you take your medications at the right time. 7. 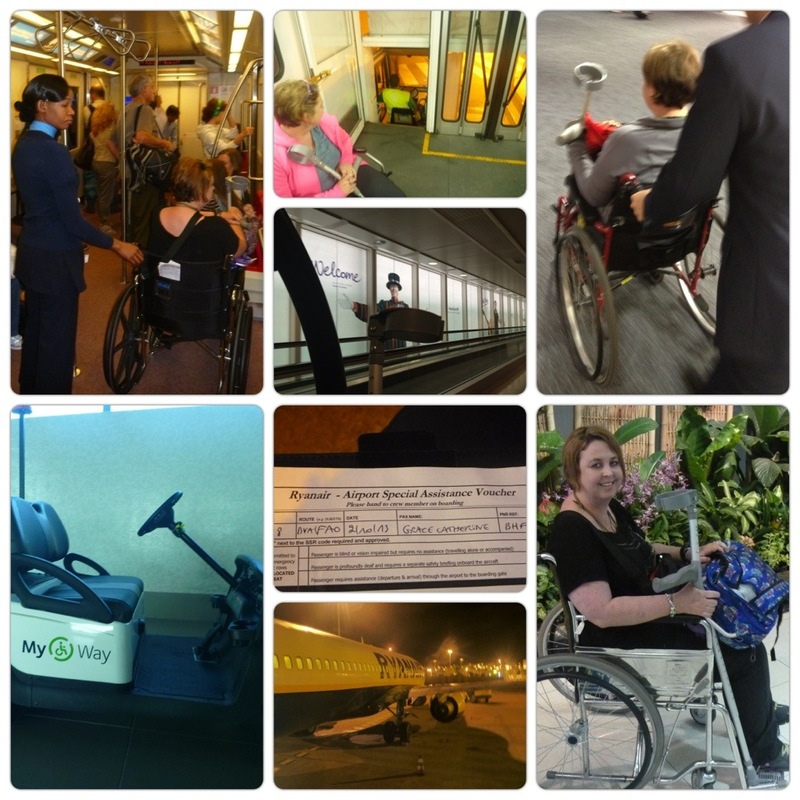 Say yes to the wheelchair ride. It comes with your own “wheeler”. They are responsible for you until you reach the gate, they help you though customs and to the correct boarding gate. An amazing help when you are tired and you can focus on your health rather than getting lost or stressed your are too slow. With special assistance you will not miss a transfer or boarding. Ps Anybody travelling with you gets to go with you – make sure they are quick as the wheelers don’t muck around :). It’s also ok to ask to stop at duty free or toilet. Otherwise they will take you directly to the gate. 8. Invest in noise reducing headphones for the plane . The headphones are amazing and cut out so much noise but you can still hear the hostess ask what you would like for dinner. 9. Travel in lifesocks – these socks keep your feet fresh and prevent risk of DVT – well worth the investment. 11. Refrain from alcohol – it really doesn’t help you adjust. 12. Use your time at destination clock to work out when to sleep. Use an eyemask to block out the light and turn up your headphones for peace and quiet. 13. Have your ride from the airport prebooked for pick up – it may cost a few dollars more but makes your arrival to your destination much easier. Combined with a special assistance pickup you should arrive at your destination fresh and ready to explore and enjoy. Ps don’t go to sleep until dark at your new destination and keep drinking water. This will help with your circadian rhythms and allow you to wake up refreshed and adjusted.